Download the pdf version of this issue by clicking here. The word ‘CATECHIST’ comes from the Greek word meaning ‘to echo’. As Catechists or teachers of RE we do not proclaim our own word. We echo the message of Jesus Christ our Lord. 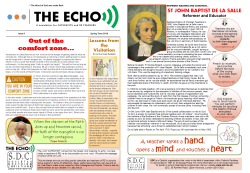 This newsletter aims at providing parish catechists and teachers of RE in schools some support in terms of reflections, ideas, useful resources they can use and so on. Feel free to share with other colleagues and friends. There is also a pdf version which you can download by clicking on the thumbnail below. 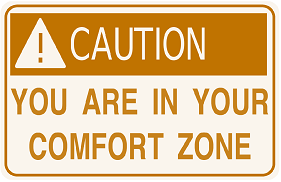 In 2012, the then-Cardinal Jorge Mario Bergoglio - now Pope Francis - published a letter to the catechists of his Archdiocese of Buenos Aires in which he dealt with this issue of avoiding ’getting used’ to what we do and being brave to move out of our comfort zone. 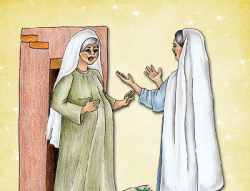 He made an invitation to catechists of his diocese to widen the horizon of their vision and work to extend their work and their catechesis to a wider audience. 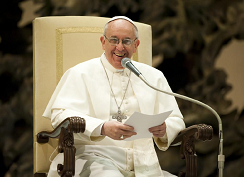 In his own words, ’catechesis would be seriously compromised if our experience of faith were to leave us confined in and anchored to our familiar world or in the structures and spaces that we have been creating over the years. To believe in the Lord is always to enter anew through the door of faith that makes us go out, to set out on a journey, to leave our comfort zone’ - Such a key concept that he would later on repeat to a wider audience when he became Pope and invited us all to ‘go to the peripheries’ and reach out to other people who have never heard of Christ or are away from him. What is the step you need to take to reach out to those in the periphery? "When the charism of the Faith dries up and becomes rancid, the faith of the evangelist is no longer contagious." 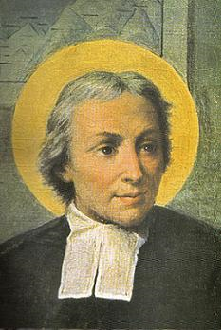 Declared Patron of Christian Teachers in 1950, John Baptist de La Salle was a poineer in educational theory and practice. Born of a noble family in April 1651 at Rheims, in northeastern France, he was of a lively and intelligent disposition and aged sixteen he became a canon in the Cathedral. He studied enthusiastically at the well known seminary of Saint-Sulpice. Ordained a priest, he could have lived an easy and comfortable life as a rich canon. But he was providentially ‘caught’ among a group of priests and lay men and women who were whole-heartedly involved in educating the poor children of the lower classes and opening charity schools. In seventeenth century France education enjoyed a high standing and it was almost the exclusive domain of the Church. Before his death, Fr Nicolas Roland, a canon colleague, entrusted his school and orphanage to the protection of Fr Jean Baptist. De la Salle immediately took care of the teachers and bought a house to accommodate them for he wanted to live with them. This was the beginning of a teachers’ training college. Both Jean’s parents passed away by 1672. His brothers judged that Jean was clearly out his mind when he even lodged teachers in their family house. But he went even further: as he was the eldest, he ascertained that all family members got their legitimate share of the family’s wealth, and then he gave out his inheritance to the poor. In 1684 De la Salle together with twelve teachers committed themselves to dedicate their lives as poor lay religious for the education of children of the common people. Jean led an ascetical and mystical life, but he was also a genius of organisation and pedagogy. He removed the study of Latin from the first classes of primary schooling; children were to be taught in French. He introduced group learning within lesson but he was also keen to make sure each pupil was given individual attention. He encouraged his teachers to understand well not only their subjects but also the children in their class. His work eventually spread to several cities, including Paris and beyond. On 6th June 1694 Jean Baptist and six of his closest collaborators vowed to God “to form a society to maintain free schools together and with others” - thus founding the Institute of the Brothers of the Christian Schools whose members were not to be priests so as to be solely dedicated to teaching children and adults. In fact Jean set up technical schools to teach crafts and trades. The growth and success of the Institute was beneficial wherever it was introduced, but it also provoked harsh antagonism because free schooling was a threat to established paid ‘school masters’. De la Salle died in Rouen on 7th April 1719. Pope Leo XIII canonised him in May 1900. Teachers who are themselves not actively involved in the learning process, force their students to drink from stagnant water. Preach by example, and practise before the eyes of the young what you wish them to accept. God expects you to touch hearts. You can perform miracles by touching the hearts of those entrusted to your care. A teacher takes a hand, opens a mind and touches a heart.